Welcome home, Meghan Markle and Prince Harry! The royal couple have officially moved out of their Kensington Palace home and into their new cottage in Windsor, PEOPLE confirms. Meghan and Harry, who are expecting their first child in a matter of days, are now set up in Windsor Castle’s Frogmore Cottage, close to the house where their evening wedding reception was held and where their engagement photos were taken. Windsor, located about 25 miles west of London, is a “special place” for the couple, their spokesman says — and was, of course, the setting for their wedding last May. Plans for the move were originally announced in November, just one month after Meghan announced her pregnancy. Harry and Meghan have lived in Kensington Palace’s Nottingham Cottage since their engagement, but the two-bedroom home was never likely to be a long-term residence — especially once they had children. The cottage was in need of major renovations, as it was initially divided into five units as home to the palace staff. As a new family residence, “it would need considerable, lengthy refurbishment,” a royal source told PEOPLE. Windsor, meanwhile, “has more space for children” and “has a special place in their hearts,” the source added. Prince William and Kate Middleton have their London home at Kensington Palace — at Apartment 1a, which has around 20 rooms. It had been suggested that Harry and Meghan might have the neighboring Apartment 1, but one of the Queen’s cousins lives there. It was recently announced that Harry and Meghan have official split royal households from William and Kate. The Sussexes and the Cambridges have broken up their joint “court” at Kensington Palace by creating two separate offices, the palace announced. “This long-planned move will ensure that permanent support arrangements for The Duke and Duchess’s work are in place as they start their family and move to their official residence at Frogmore Cottage,” a statement from the palace reads. With William one day set to be the Prince of Wales — and all that entails as heir to his father Prince Charles — Harry and Meghan will want to forge their own path, so it’s a natural time to split up, insiders believe. Their new home at Windsor Castle’s Frogmore Cottage is rich with history – and a connection to another American who married into the British royal family. Wallis Simpson – the American-born socialite who wed King Edward VIII, forcing him to give up the throne after less than a year because his family (and parliament) wouldn’t accept Simpson, the woman he loved (who was twice divorced) as Queen – is buried next to her husband near the cottage in the Royal Burial Ground. Simpson and Edward are buried behind the mausoleum that entombs Queen Victoria and Prince Albert. Three of Queen Victoria’s children – Princess Helena, Prince Arthur and Princess Louise – are also interred there, along with many other members of the royal family. In the adjacent Frogmore gardens is the mausoleum of Queen Victoria’s mother, the Duchess of Kent. Meghan and Harry also have some new royal neighbors: Queen Elizabeth and Prince Philip! Nearby Windsor Castle is one of the monarch’s primary residences. As Meghan has faced quite so much abuse online and in the press since she married Prince Harry, it’s heartening to know that social media can actual have a positive impact, too. Back in March 2019, Meghan took part in a panel for International Women’s Day at King’s College London. 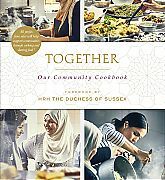 The duchess revealed that she tries to avoid social media saying (via ITV News), “I don’t read anything, it’s much safer that way, but equally that’s just my own personal preference, because I think positive or negative, it can all sort of just feel like noise to a certain extent these days.” But hopefully, the donations made in honor of #GlobalSussexBabyShower will show Meghan that she has a lot of supporters worldwide, too. After months of speculation, Buckingham Palace and Kensington Palace announced the full plans for Prince Harry and Prince William to go their separate ways and create separate households on Thursday, March 14. 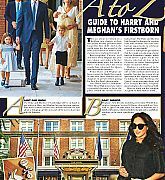 The move will see the Duke and Duchess of Sussex break away from the Cambridges to create an entirely new office of communications staff and courtiers at Buckingham Palace, with former Hillary Clinton campaign advisor Sara Latham taking on the role as press secretary. Staff who previously worked for Prince Harry and Duchess Meghan have chosen to remain at Kensington Palace, focusing their efforts wholly on the Duke and Duchess of Cambridge as William continues to prepare for his eventual role as king. Among those staying at the previously joint court are former head of communications Jason Knauf, who has been promoted as senior advisor to guide the Cambridges on their charitable initiatives, and Christian Jones, who joined the team in December 2018 as Knauf’s deputy and will now lead the entire communications operation. In this new role, The Duchess will highlight the Trust’s partnerships with young people across the Commonwealth, and in particular its work supporting women and girls. In celebration of International Women’s Day and to mark this appointment, Her Royal Highness will this afternoon join a special panel discussion of female thought-leaders and activists convened by The Queen’s Commonwealth Trust, to discuss a range of issues affecting women today. 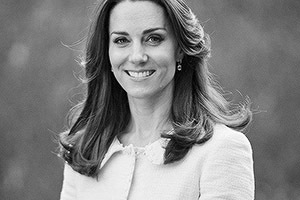 Those joining The Duchess for the unique panel today include Annie Lennox OBE, founder of The Circle, an organisation supporting and empowering women’s lives around the world; Adwoa Aboah, founder of Gurls Talk, an open community where young girls can talk about the issues that matter to them; Julia Gillard, Former Prime Minister of Australia and Chair of the Global Institute for Women’s Leadership at King’s College London; Chrisann Jarrett, Founder of Let Us Learn; and Angeline Murimirwa, Executive Director of the Campaign for Female Education (CAMFED) in Africa and co-founder of CAMA, a pan-African network of young female leaders. The panel will be chaired by Anne McElvoy, Senior Editor of The Economist. The Queen’s Commonwealth Trust will be live posting on its social channels on Friday 8th March 2019 and a full video of the discussion will be shared by 5:00pm GMT on the Queen’s Commonwealth Trust website. When Meghan Markle steps onto the stage Friday for a public discussion on girls’ education, she will be continuing a fight she has championed for many years around the world. Angie Murimirwa, executive director of Campaign for Female Education (CAMFED)this link opens in a new tab, will be among those joining Meghan on a panel discussion for International Women’s Day — along with musician and activist Annie Lennox, model and activist Adwoa Aboah and former Prime Minister of Australia Julia Gillard. “[Meghan’s] a long-standing supporter for women’s rights, for equality and for equal opportunities, and it is really exciting that she is doing this along with other women who are in the space of education on International Women’s Day,” Murimirwa tells PEOPLE. After back to back engagements and the launch of four successful patronages, the Duchess of Sussex is taking a well-earned break—in New York! Sources reveal to BAZAAR.com that Duchess Meghan has made a personal visit to the Big Apple to see friends ahead of the birth of Baby Sussex in less two months. Meghan flew from London to New York on Friday, February 15, for five nights of rest, shopping, and good food with some of her closest and most loyal pals—her first time in NYC since getting married. While Meghan is spending much of her days enjoying the amenities and private dining arrangements available at her five-star hotel (name respectfully withheld for security reasons), there has also been time to enjoy some of her favorite spots in the city. Joined by stylist pal Jessica Mulroney, who was in town for Good Morning America commitments, the pair visited Ladurée in New York’s SoHo district on Saturday, February 16, for macarons and tea in one of the bakery’s private spaces. Just a day before traveling, the duchess spent a quiet Valentine’s Day with Prince Harry at their Kensington Palace home—a world away from what she once described as the perfect Valentine’s in NYC. Later this week, Meghan will be taking her last flight until after the birth. She’s headed to Morocco with her husband for an official two-day visit to North Africa arranged by the British government. Meghan Markle and Prince Harry helped honor a courageous group of heroes. The couple took part in a panel on Wednesday for the Endeavour Awards at Kensington Palace. The Sussexes’ role had been previously unannounced. The ceremony is likely to be held in the coming weeks. Last year, Meghan also helped in the judging — and, on February 1, joined Harry at the special awards evening to hand out one of them. “I’m truly privileged to be here,” she said in a short speech before giving the prize. 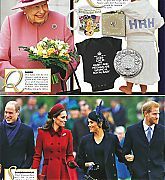 That evening, which was their first night out in an official capacity since they’d announced their engagement, came as Harry’s brother, Prince William, and sister-in-law, Kate, were away on their week-long tour of Sweden and Norway. The awards align with other royally backed initiatives to help veterans, including Harry’s Invictus Games. The Duke and Duchess of Sussex will begin the new year with an away day to the north west of England, Kensington Palace said on Monday. 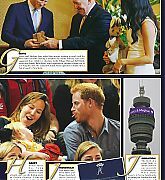 After taking a short break to celebrate Christmas and the New Year, the couple is back in London and will resume work with a visit to the town of Birkenhead, Merseyside. According to the itinerary released this afternoon by Kensington Palace, Harry and Meghan will meet veterans and unveil a plaque in the town’s Hamilton Square before visiting an organization that supports vulnerable women and the Hive, Wirral Youth Zone where they will take part in workshops. Ms. Markle is looking forward to hitting the ground running,” were the famous words uttered by a Kensington Palace spokesman to a room full of journalists, including this one, during a briefing just over a year ago. After months of speculation about Meghan’s potential as a member of the royal family, a November 28, 2017 press conference in Buckingham Palace, just a day after her engagement to Prince Harry was announced, offered a glimpse of what was to come. Having already used the small platform she created while on Suits to spread the word of women’s rights in India and female empowerment for the UN, it was clear Meghan had big plans for her life as a duchess. But even those with the highest of expectations didn’t imagine she would be closing out 2018 with 105 royal engagements under her belt, a four-country tour completed, and a New York Times bestseller. Hit the ground running indeed. She started the year as Meghan Markle but is ending it as The Duchess of Sussex and soon-to-be mother to the seventh in line to the throne. It has been a whirlwind 12 months for the former actress whose arrival into the royal family has captivated the world. From Brixton to Bondi Beach, Nottingham to Nuku’alofa, crowds have cheered, chanted and even cried after meeting Meghan, who officially took her place in the history books when she married Prince Harry in May. For the second year running her name was the most searched on google.co.uk, while “Royal Wedding” and “Royal Baby” topped the charts for news event trends. It would be difficult to think of another person who has generated such global interest throughout the whole of 2018, and Meghan’s star is not showing any signs of fading as she prepares for a future in the spotlight. Photographed at London’s Fashion Awards on 10 December, a pregnant Meghan Markle was rendered beatific, but within hours the image caused the internet to enter meltdown. Pandora Sykes speaks to the photographer who captured the image and explains why the Duchess Of Sussex is one of the greatest influencers of our time. It must be a sad month in the Kardashian-West household. Kim’s bottom, once pronounced to have broken the internet, is no longer the tumulus at the centre of cultural commentary. For there is a new controversial curve in town: the Duchess Of Sussex’s stomach.